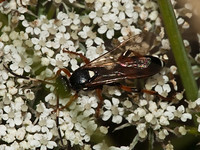 Hymenoptera is one of the largest orders of insects, comprising the sawflies, wasps, bees, and ants. The name refers to the heavy wings of the insects, and is derived from the Ancient Greek (humen): membrane and (pteron): wing. The hindwings are connected to the forewings by a series of hooks called hamuli. 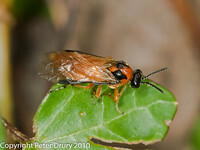 There are two Sub Orders - Apocrita (Wasps, Bees and Ants) and Symphyta (Sawfly). Eyes deeply notched or crescent shaped. At rest, the wings are foldedback along the side of the body. The middle tibia has two spurs. They live in annual colonies, each colony established by a mated queen in the spring. The colony starts with a few hundred to several thousand female workers (smaller than the queen) and males appear in the colony in late summer. Males have a larger antenna than the females (13 segments rather than 12). Adults feed mainly on nectar and other sweet materials. The young are mainly fed on other insects collected by the workers. The colony disintegrates in the autumn and only mated females survive the winter. Some species (Known as Cuckoo wasps) do not produce workers but lay their eggs in the nests of other wasps. Ichneumon wasp species are highly diverse, ranging from 3 mm (1/8-inch) to 13 cm (5 inches) long. Most are slender, with the females of many species (particularly in the genus Megarhyssa) having an extremely long ovipositor for laying eggs. The female finds a host and lays an egg on, near, or inside the host's body. Upon hatching, the larval ichneumon feeds either externally or internally, killing the host when they themselves are ready to pupate. Despite looking formidable, the ovipositor does not deliver a sting like many wasps or bees. It can be used by the wasps to bore into and lay eggs inside rotten wood. A large family of imsects with three Subfamilies. Apinae - Includes the well known Honey Bee and Bumble Bee. 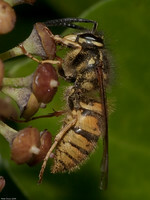 Nomadinae - Cuckoo Bees which lay their eggs in other Bees Nests. 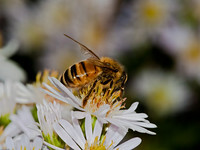 They all feed on pollen or nectar and most are equiped with 'leg baskets' to carry the pollen off to their nests. 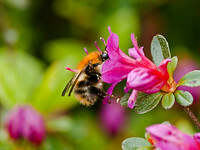 Most are solitary bees but others form colonies. A family of about 15000 known species world-wide. Workers are always wingless but sexual ones are winged. The queen breaks off her wings soon after mating, The antenna are usually 'elbowed'. Sawflies are recogiseable from most other insects in the order in that there is no waist between the thorax and abdomen. This family is one of the oldest in the order (200 million years) and although most are herbivores it is believed that an ancestor gave rise to the ants wasps and bees. 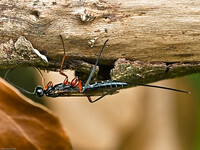 The females has a saw-like ovipositor (which gives rise to their common name) which she uses to cut plants and lay her eggs.